Different locations can be accessed by traveling, provided the hunter has attained the requisite title and earned the appropriate map piece (often by Loot, Crafting or Cartographer). 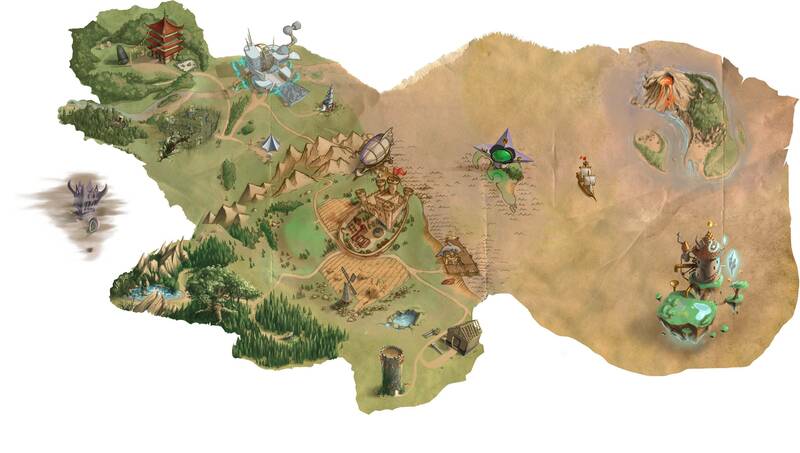 There are 13 known permanent regions with 60 permanent and 2 event locations between them. The King's Stockade was discovered on 25 April 2009 and is an 'area' where banned players are sent; it is not a location that hunters can travel freely to, or from, although it is free in terms of travel costs! Travel is free of cost between all locations. Locations vary on whether mice are able to steal extra gold, points, or cheese upon failure to catch a mouse. There are 2 temporary locations: King's Party Zone and Ronza's Traveling Shoppe. The King's Party Zone is where special Events take place in the Kingdom. This zone appears in the Gnawnia Region at the crater lake just north of the King's Arms location. For a brief period after most events, the King's Party Zone becomes the Vacant Lot. While the Vacant Lot is open, Hunters can make purchases at the event shoppes, but most event activities and mice are no longer available. Occasionally, Ronza will visit and set up her Traveling Shoppe. This is a location that sometimes uses the King's Party Zone location, though she has been known to park her airship elsewhere in Gnawnia or Burroughs. Her recent visits have coincided with events already in progress. A history of her visits can be found here. Lunar New Year: Coincides with the Chinese New Year. Valentine's Day: Coincides with Valentine's Day on 14 February. This event is sometimes combined with the Lunar New Year event. MouseHunt Birthday: Celebrates the 7 March birthday of MouseHunt. Spring Egg Hunt: Celebrates the spring season. Halloween: Coincides with the Halloween holiday. Great Winter Hunt: Celebrates gift giving and the New Year. Events for the last year are listed in the chart below. Historical uses of the King's Party Zone can be found on the Events page. This page was last edited on 18 April 2019, at 12:42.